Sump Pumps are mostly used to drain water out of a flooding area. These pumps give you the easiest and quickest opportunity to take care of floods in your home, and also keep the basin dry. Canarsee has a variety of quality Sump Pumps from Little Giant and Liberty Pumps. The 240 from Liberty Pumps is a Manual Sump Pump, 10' cord, 1/4HP, 115V. This Liberty Pump features .. The 230 from Liberty Pumps is a Manual Sump Pump, 1/3HP, 10' cord, 115V. This Energy Saving Liberty .. The 240-2 from Liberty Pumps is a Manual Sump Pump, 1/4HP, 25' cord, 115V. Features:.. The 230-2 from Liberty Pumps is a Manual Sump Pump, 1/3HP, 25' cord, 115V. Features:.. The 506801 from Little Giant is a Manual Sump/Effluent Pump, 1/3HP, 10' cord, 115V. The Little Giant.. The SJ10 from Liberty Pumps is a SumpJet Water Powered Backup Sump Pump w/ 1-1/2” discharge. The Lib.. The 450 from Liberty Pumps is a Manual Sump Pump, 10' cord, 1/2HP, 115V. This submersible sump pump .. The Liberty 404L Pump is a pre-assembled 1/3HP drain pump with.. The HT450 from Liberty Pumps is a Manual High Temperature Sump Pump (180F), 10' cord, 1/2HP, 115V. T.. The CSP-237 from Liberty Pumps is a Crawl Space Sump Pump Kit w/ 16.5” x 15” Basin, 1/3HP Sump Pump .. The CSP-257 from Liberty Pumps is a Crawl Space Sump Pump Kit w/ 16.5” x 15” Basin, 1/3HP Sump Pump .. The HT450-2 from Liberty Pumps is a High Temperature Submersible Sump Pump, 1/2HP, 115V, 25' cord, A.. The CSP-457 from Liberty Pumps is a Crawl Space Sump Pump Kit w/ 16.5” x 15” Basin, 1/2HP Sump Pump .. The SJ10A from Liberty Pumps is a SumpJet Water Powered Backup Sump Pump w/ Alarm. The Liberty Pump .. The HT41M from Liberty Pumps is a Manual High Temperature Sump Pump (200F), 10' cord, 4/10HP, 115V. .. The HT41M-2 from Liberty Pumps is a Manual High Temperature Sump Pump (200F), 25' cord, 4/10HP, 115V.. 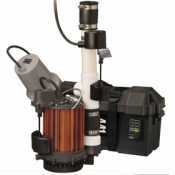 The PC237-441 from Liberty Pumps is a Sump Pump Combo (1/3HP Sump Pump & 12V Battery Sump Pump) .. The 511610 from Little Giant is a Manual High Temperature Sump/Effluent Pump w/ 15' cord, 1/2HP, 115.. The Liberty Pump ELV 290 is a 3/4HP, elevator sump pump with a.. The SBX35 from Liberty Pumps is a SumpBox System w/ 1/3HP Sump Pump, 41 gal Basin, 1/3HP, 115V. .. The 4445000 from Liberty Pumps is a Sump Pump Platform “The Brick” for 230, 240, 250, 280 and S37 se.. The 506802 from Little Giant is a Manual Sump/Effluent Pump, 1/3HP, 20' cord, 115V. The Lit.. The HT453-2 from Liberty Pumps is an Automatic High Temperature Submersible Sump Pump, 1/2HP, 115V, ..